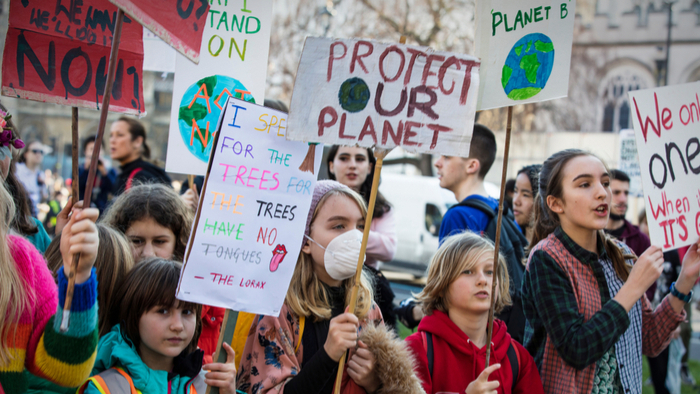 • Kaysie Brown reports on the youth-led marches occurring around the world, where students are demanding action on climate change. • How can funders work to support and build this movement? • Learn how to support youth organizing. In a world of division, young people are standing up for collective action. On March 15, thousands of young people in more than 100 countries and 1,600 cities and towns will take to the streets to march for greater ambition and urgent action around climate change. Part of their rallying cry is to push global leaders to uphold their commitments on the Paris Climate Agreement, signed by 196 countries back in 2015. Sparked by 16-year-old Swedish activist, Greta Thunberg, who has unabashedly called out big businesses and politicians for ignoring the science on climate change, these protests present a historic shift in our approach to tackling urgent global challenges. Youth climate leaders from around the world penned an open letter to leaders in advance of Friday’s strike, stating, “We are going to change the fate of humanity, whether you like it or not.” Indeed, young people are no longer accepting the status quo — they’re taking the lead now and we must listen to them. With over 1.2 billion young people aged 15 to 24 years in the world today – accounting for 16% of the global population and the largest generation of young people in history – the active engagement and leadership of youth will be critical to achieving the Sustainable Development Goals (SDGs) and averting the most severe challenges the global community is up against. And while many of the biggest headlines have focused on young people standing up for climate action, it is just one of the many persistent threats that youth face — and that the world can’t afford to ignore. Read the full article about young leaders demanding climate action by Kaysie Brown at United Nations Foundation. Giving Compass' Take: • Fast Company details a report from Bridgespan (published originally on Stanford Social Innovation Review) about how billionaires can make more "big bets" in philanthropy and be more effective with their dollars. • The report emphasizes the need for patience. Most big bettors give an average of four smaller grants to related initiatives before raising the stakes, so it helps to get the lay of the land first. • Here's more on how this method works in practice to achieving the Sustainable Development Goals. Philanthropy’s deepest-pocketed donors often short-change the causes they claim to care about the most. That’s because while the majority of the world’s wealthiest givers have expressed interest in solving complex social issues like poverty, educational inequity, environmental degradation, and human rights abuses, only 20% follow through with funding of $10 million or more to actually try to create some fundamental change. In philanthropic industry parlance, that reluctance even has its own term: “the aspiration gap.” As Bridgespan partner William Foster, whose nonprofit and philanthropist consultancy coined that term, puts it: The ambition of philanthropists to put “meaningful amounts of money to move meaningful change into the toughest social problem is as present or more present than ever. The difficulty [for most] is figuring out how to do it.” Many donors simply aren’t aware of all the potential social impact strategies they might deploy. How to effectively make these so-called “big bets” is a question consuming the philanthropic world today. Philanthropists may have shied away from advocacy efforts in the past because they envision their names associated with hot-button, perhaps intractable issues like gun control. But there plenty of other substantial, less politicized issues where concentrated donations have made major change, including Dallas billionaire Lyda Hill’s work to address the health crisis of antibiotic resistance that has curbed some livestock-raising practices and changed what’s on the menu at restaurants and in grocery stores. One largely underused tactic that could prove effective would be to create organizational endowments to cause-related organizations, which could then manage the wealth and distribute annual grants at their discretion. Read the full article about how billionaires can make more of an impact by Ben Paynter at fastcompany.com. If you are interested in Climate, please see these relevant events, training, conferences or volunteering opportunities the Giving Compass team recommends.